Danish inventor, musician, blacksmith, and cyclist, Mikael Pedersen (1855 – 1929), believed conventional bicycles were "weakest where they ought to be strongest and heaviest where they ought to be lightest.” He, therefore, restyled the conventional bicycle to resolve what he saw as the most troubling elements of design. In this noticeably unusual product, patented in 1893, Pedersen utilized a flexible woven seat, similar to a hammock. 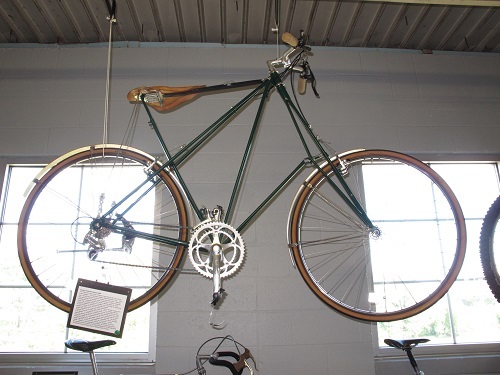 A frame composed of 14 steel rods was then designed around the saddle. The result is a complex bicycle consisting of 21 triangles and 57 separate joints. It is strong yet surprisingly light. Designer/builder: Mikael Pedersen/Pedersen Cycle Frame Co. Ltd.